BLACKSBURG, Va., April 21, 2010 – John McDowell of Blacksburg, Va., associate professor of plant pathology, physiology, and weed science, was awarded the 2010 Certificate of Teaching Excellence from the College of Agriculture and Life Sciences at Virginia Tech. McDowell teaches two graduate-level courses that are heavily grounded in molecular biology and genomics: Molecular Biology for the Life Sciences and Plant Disease Physiology and Development. 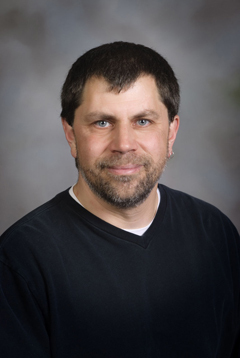 He has also been instrumental in developing an interdepartmental Ph.D. program in molecular plant sciences that involves seven departments in three different colleges. McDowell has redesigned and modernized the Plant Disease Physiology and Development course with faculty providing historical reviews of hot topics. Students learn how to read and evaluate current literature and present recent articles. He also introduced a class exercise on grant proposal writing and critical reviewing in the form of a mock grant review panel. “The students appreciated how he had turned this exercise into an authentic simulation of a grants review panel, giving them valuable experience,” said Elizabeth Grabau, head of the Department of Plant Pathology, Physiology, and Weed Science. According to Grabau, McDowell’s teaching excellence can also be found in his student advising. He currently supervises two Ph.D. students – with many past graduates to his credit – and has provided research experience to a number of award-winning undergraduates, many of whom have been recruited by excellent graduate programs. He has also been an active participant in the Partnership in Research and Education in Plants, which brings modern plant science research to Virginia high schools. McDowell was the recipient of a National Institutes of Health Postdoctoral Fellow and a National Institutes of Health Predoctoral Training Grant Fellow. He received his bachelor’s degree in cell and molecular biology from the University of Tennessee and his Ph.D. in genetics from the University of Georgia.